1. Make food you will want to eat. This one seems pretty obvious, but it is really important to be realistic about the kinds of food you will want for the entire week. It can get pretty tiring having oatmeal every morning and salad for lunch every day. As long as you spruce it up and keep it interesting, you will be more inclined to stick to your plan! Things to consider: Do you have a special recipe you wanted to try? Are you craving something? Most importantly, is your week extra busy? If so, you might want to think of recipes that are fast and easy, especially for the weekdays. Note: having a list of ~20 recipes is extremely helpful. eason, and if you have coupons for an item to be more budget-friendly. 3. Don’t plan a meal to cook for every day of the week. If you can recycle leftovers or ingredients, you can save both time, money, and room in your fridge. Example: think of meals that have ingredients in common; if you made grilled chicken on Monday, make enough so that you can chop up leftovers for a chicken salad for lunch on Tuesday or shred the meat for tacos a later night in the week. 4. FREEZE! Make extra servings of a dish on a day you have more time to cook. For example, if you made a huge pot of soup, you can freeze it in individual freezer bags or heavy-weight/ air-tight containers. 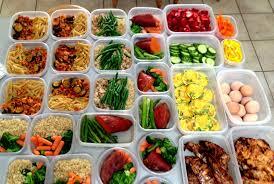 For portion control or an easy packed lunch, you can even freeze them into individual servings. This helps prevent waste and is a useful tool for saving food that you might not have eaten before it goes bad. 5. Give yourself some wiggle room. If you planned to cook one night and were just too exhausted and bought take-out or just reheated leftovers – it’s no big deal! 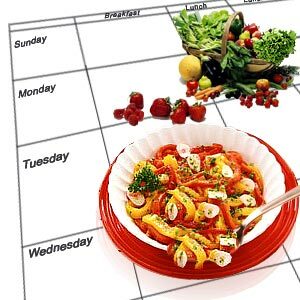 Just switch up the days in your meal plan so that you can cook what you planned later. Try to keep your plan flexible and don’t beat yourself up if you didn’t stick to what you planned. Meal planning, like most things, gets better with practice. The more you try to do it, the better you get at it! I’m sure you will even develop your own little tricks and methods that work for you. If you do have some other tips, please mention them in the comments to share with other readers! What is So Great About Gardening? One of the biggest concerns that I have as a dietetic student is connecting the foods that we eat to what they actually look like. I read a recipe once and it asked for kohlrabi. I had no idea what it looked liked, or let alone how to cook it. 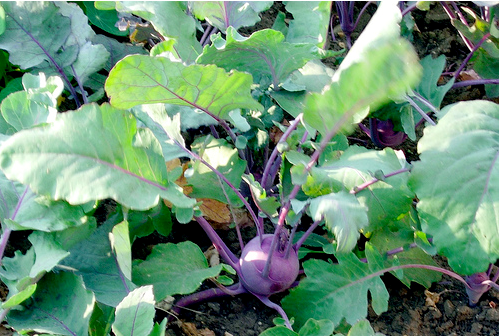 In case you have no idea what it is, kohlrabi looks similar to a beet, but the bulb or the swollen stem is above ground. The plant belongs to the cabbage family. The leaves and the stem are edible and it can be eaten either raw or cooked. The more young or tender the stem-bulb, the sweeter the flavor. In my food service class, taught by a professor who was a Cordon Bleu chef, a class member suggested if we could bring fruits and vegetables that we have never eaten or prepared before and if we could learn how to cook these items during lab. He agreed and the next lab, sure enough, everyone brought something that they were unfamiliar with. During that lab, we prepped and cooked a variety of vegetables, mostly root vegetables and tried fruits we rarely would have tried on our own. Although some students needed a little persuasion. The variety of root vegetables people brought included kohlrabi, Jerusalem artichokes and a few others I could not pronounce. Someone brought a beautiful, but funny looking broccoli called Romanesco, also known as a Romanesque cauliflower. After looking at all the varieties of vegetables I thought to myself, “What would be the best preparation method for this fruit or vegetable?” I was excited. This was going to be a fun challenge. In addition to trying to find new and different fruits and vegetables in both regular and ethnic grocery stores, I started visiting farmer markets more often. If you have ever purchased fruits and vegetables at a farmers market you know the taste and texture of locally grown vegetables and fruits are unlike any other. 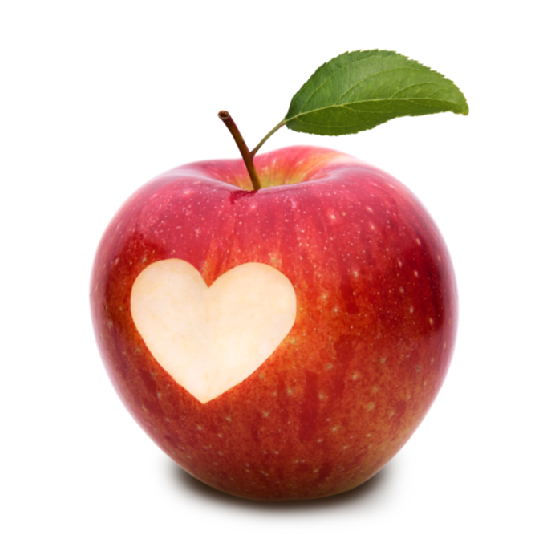 Apples just taste sweeter. Carrots have that extra crunch and if you have ever tasted blackberries grown on the vine or tomatoes, you know the flavor profile is nothing short of amazing, for lack of a better word. So I started to ask the question if I were to grow my own fruits and vegetables would they taste like this? Well, I am no gardener, but I love food. I agree with Alice Waters on that note. So while I was at my local library I saw a sign for a seed library. I thought okay, this is worth looking into? So I researched the history of a seed library. It turns out like the “Slow Food” movement it was also started in the bay area in California of all places. No wonder California is the great hub for agriculture. It turns out that if you buy certain fruits and vegetables in the store and plant them in the ground they may not grow, or they may grow, but you do not get the same or lasting results. Why? That is a different topic for another time, but to make a long story short some fruits and vegetable will not produce viable seeds that you can plant. I tried planting a cucumber from seed and only a few plants grew, but I tried planting the same seeds from the cucumbers that did grow again the next summer and the results were disappointing. So I was curious as to why my cucumbers did not grow the second time around. Like I said, I am a dietetic student, and gardening is an entirely new concept to me. I went to the meeting for the seed exchange at my local library and met Tom, our local master gardener. He explained to me what an heirloom seed variety was. The seeds that I had may have not been good seeds to start with. Heirloom varieties are open pollinated seeds that are crafted by nature to grow in the local environment. They adapt to their growing conditions. Heirlooms include all seed plants and just as families past on valuables from one generation to another, also called heirlooms, seeds were saved and handed down to the next generation to ensure the health and well being of the families that cultivated them. We have moved far from this agricultural practice, but people are starting to appreciate the value of saving these seeds not just to preserve tradition but to continue with genetic variety. Tomatoes and carrots come in very many different colors. The seed library is actually a collection of heirloom varieties preserved and shared with members of the community. In the long run collecting and saving seeds helps to preserve biodiversity. There are quite a few seed libraries, some in your local community and some are even online. The best part, it is FREE. If you are interested in learning more I highly encourage you to go to your local library to see what programs are available to you. My library not only gives you the seeds, but it also teaches patrons how to plant, grow, harvest and save them. All of these things are of course at no charge. In return for taking the seeds, the library asks that patrons bring a few back to replenish and continue the work of the seed library. The seeds that my library has include such plants as: eggplant, tomato, bell peppers and squashes. There are a lot of questions I have about starting a garden, but I find that many people from all walks of life like to share seeds, recipes and words of encourage to help you get started. If you live near Pomona and the Diamond Bar area the Growing Home is a wonderful resource. You can check their website for class dates, schedule a time to see what is growing, take classes or learn more about the best practices to cultivate and maintain your garden. Learning by doing it is a great place to start. The information is out there, we just have to learn how to ask the right questions. Someone asked me why would you ever want to grow your own garden and how much can you really produce? Well, I have lots of personal reasons for why I would like to grow my own garden, but my biggest reason was cost. Do you know how expensive herbs cost at the grocery store. I think learning to grow herbs is actually a nice simple way to start. The second reason and main reason I wanted to learn more about gardening is taste. I can remember biting into an heirloom tomato and thinking, “Wow, this does not taste like the same tomato I get at the store.” The added benefit of growing your own produce is that you build a connection with the land, people and your community. There was a reason why cities had community gardens. People could rally to meet and support each other, sort of what a Starbucks is for our generation. In addition to meeting in the garden, you get to work in the garden, which means fresh air, sunshine and exercise. Just think of all the Vitamin D you could be making if you were outside. My family came from an agrarian society before they came to the United States. Sadly, my mother did not keep up with her families’ farming traditions and she will not be able to past down this knowledge to her children or to her grandchildren. However, if we make the time to learn it now, between the both of us at least we can past down some basic information for future generations. Plus, it gives us more time to spend together besides shopping. People tend to eat what they grow. So if you grow vegetables, you eat more vegetables. As dietetic students we always stress variety in our diets. Eating different fruits and vegetables also trains our pallets so that we are more experienced about what and how certain foods should taste. The way I look at it, gardening is the precursor to cooking and we all know what comes after cooking. Eating is a great opportunity to bond with strangers, so that relationships may blossom into friendships and friendships may turn into extended families. This is the biggest take home message I have learned from dealings in the garden. Is it just me or are side dishes usually better than the main course? This warm kale salad will have you wanting more and more. 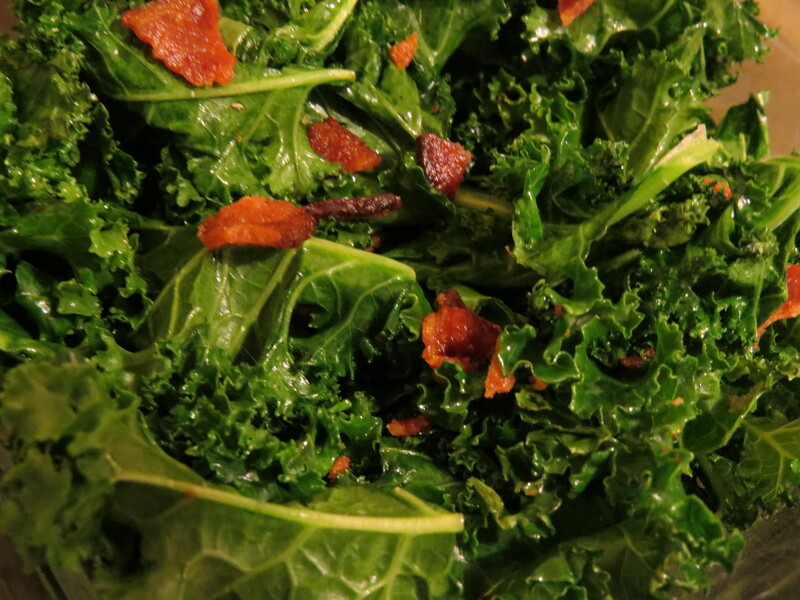 Sauteed kale topped with bacon is the most deliciously shameful seasonal side you’ll enjoy all winter. Try this dish with grilled chicken breast and a helping of mashed sweet potatoes! In a large nonstick skillet heat the extra virgin olive oil and saute the chopped onion until it is tender. To the chopped onion, add the chopped kale and saute until the kale begins to wilt. 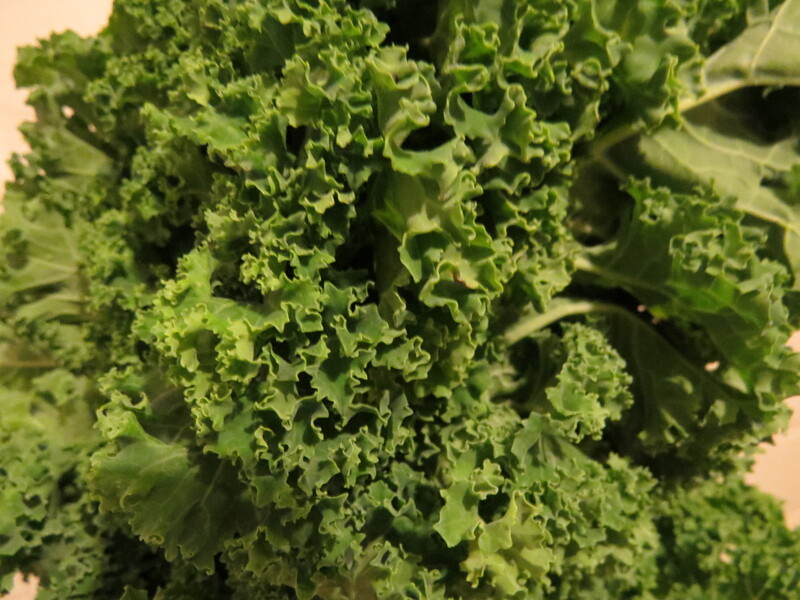 Season the kale with the red pepper flakes and salt. Serve with crumbled bacon bits and lemon wedges! What does eating seasonably mean? Eating seasonably means eating the right items such as fruits and vegetables according to their natural harvest cycles. There are 3 main reasons to eat seasonably. Experts agree that eating seasonably means better taste, better value and a better impact on the planet. As nutrition students, getting more people to eat their fruits and vegetables is one of the reasons why eating seasonably is so important. Fruits and vegetables taste better because fresh seasonal produce develop the right amount of key nutrients including sugars during their natural growing season and these compounds peak right before harvest. Each variety of fruit and vegetable has their own growing season. Since we live in a very temperate and mild climate, there are many plants including fruits and vegetables that are made available to us year round. However, there are some key things to remember about fruits and vegetables in order to maximize their unique flavor profiles. Eating seasonably is a better value. Research has shown that a basket of fruit and vegetables bought in the summer can be as much as a third cheaper than the same basket bought out of season. When we go to our local grocery store, you will notice that some fruits and or vegetables are cheaper during certain times of the year. Generally, fruits and vegetables are their cheapest during their natural harvest season. Eating seasonably is more financially advantageous from a consumer standpoint in addition to getting the most flavor and nutrition from the fruits and vegetables we purchase. Fruits and vegetables that are grown locally are cheaper to produce because it does not involve travel expenses, which can add to the final cost especially with current gas prices. Eating seasonably is also better for the planet because growing in season means plants require less energy, in terms of fossil fuels. 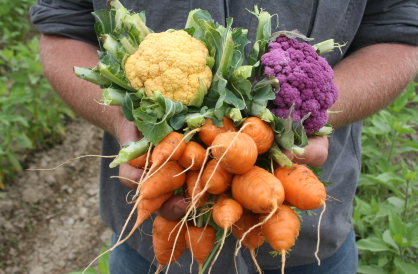 Fruits and vegetables grown seasonably are also grown locally so they do not have to travel as far to reach a market. The less gasoline and diesel we use, the less greenhouse gases we create thereby lessening humanity’s carbon footprint on the planet. Contrary to what most people think, salads are not just for hot or sunny days, although they are a wonderful way to rehydrate your body and your taste buds. Often when we think about the cold winter months ahead, most people think about hot soups and stews. Actually, leafy greens such as arugula, Belgian endive, chard, chicories, curly endive, escarole, kale, radicchio, and lettuce of most varieties will turn bitter in warmer weather. 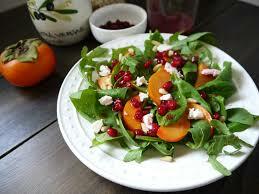 Winter is the best time to consume these types of vegetables especially if you are afraid to try new varieties. The same holds true with certain cruciferous vegetables including broccoli, broccoli raabe, brussels sprouts, cabbage and cauliflower. These vegetables are generally milder in flavor during the winter months. Cabbage will actually become sweeter the longer you cook it. Surprisingly, the two most important vegetables during the winter months are cabbage and potatoes. Most varieties of potatoes are harvested in the fall and made available during the winter because the potato itself is an amazing storage vegetable. Winter is definitely not lacking in spices and herbs. 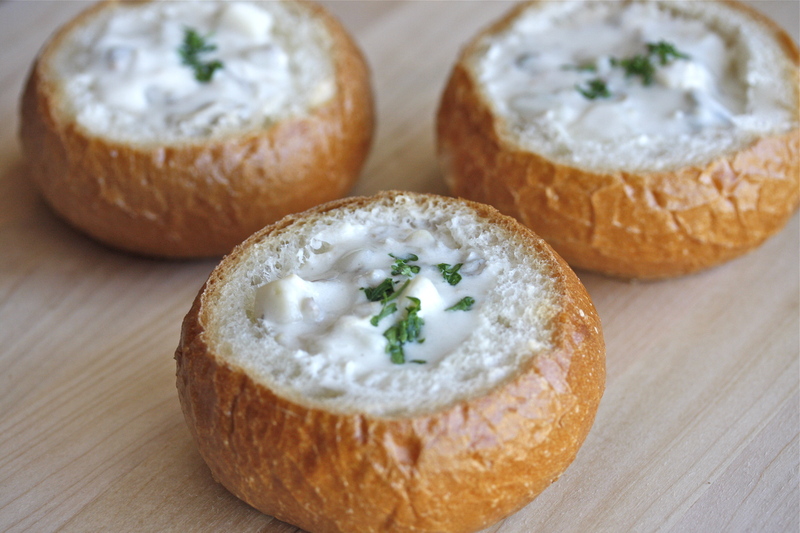 Celeriac or celery root is better in the cooler months along with garlic and onions. Garlic is more plump and sweet in the late summer and fall. Onions and shallots are better fresh and more flavorful during the winter months. Plants such as garlic, onion and shallots have numerous layers that keep the plants from drying out, serving as nature’s packing material. The layers in essence lock in the flavor of the bulbs along with the moisture. The herbs that do best during the winter months are rosemary, parsley, thyme and sage. 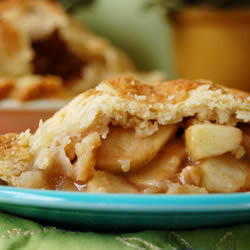 If you love apples, now is the time to enjoy them. The natural harvest cycle is late summer through fall. The berries that are best are cranberries and grapes. Generally grapes ripen at the end of summer, but they can continue late into fall. 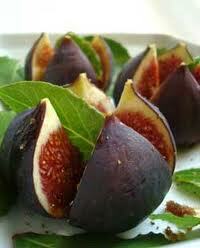 The most memorable fruits during the winter months are figs, persimmons, pears and pomegranates. Pomegranates are in season starting in October and are usually available through December. 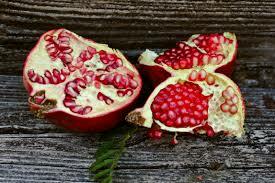 If you ever get to try the different varieties of pomegranates, “wonderful” is the sweetest and the largest. So how do you know if you are eating seasonably? As a general rule of thumb: the winter months means squashes, pumpkins, cabbages and potatoes. Think of it this way…all the vegetables that you would throw into a hearty stew are generally the vegetables that are in season and all the desserts you would see around the holidays, such as pumpkin pie, persimmon bread, apple pie and figgy pudding would be the fruits commonly enjoyed during this winter season. To make remembering what is in season and what is good to eat during the winter months easier, just imagine the following: salads are a must, you can add pomegranates or cranberries to your salad for a bit of flare, both for the color contrast and flavors followed by a nice hearty stew or chowder (made from cream and potatoes) and finally for dessert a nice slice of warm apple or pumpkin pie. Happy winter!